Last week in art class we were inspired by a book of poems about the seasons called "Red Sings From Treetops." The poem about fall got the children thinking about fall colors and their associations to them. The children learned about the "wet on wet" watercolor technique. Each group started with one of the primary colors, then did a second painting where they added a color to create a secondary color. 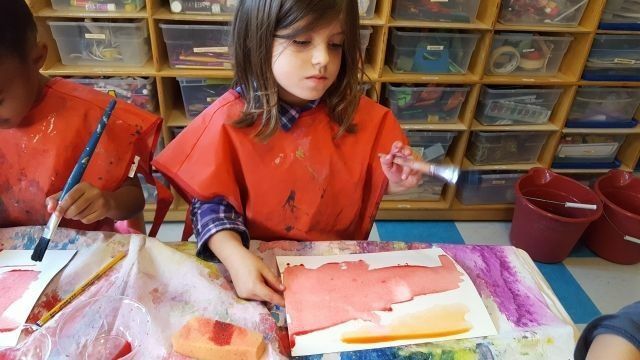 The children learned how to use a delicate touch while experimenting with brushes, sponges, cotton swabs and paper towels, and learned or reinforced what they knew about color mixing. These fluid watercolor paintings will be used as backgrounds for future work, so stay tuned. I told the children to be keen observers of leaves in the weeks ahead. You can help them notice the various shapes, sizes, and colors. We will be incorporating these observations into our art during our next few classes.